I have one or two smaller disks left so I'm thinking of making a couple of 'diskata' (Cowboy woks). You can cook up a lot of food in one with just a propane burner. I would skip the legs and make a small stand instead. This is an old post, but I'm hoping Joanne is still monitoring this thread. Regarding the discata/discada photo - Have you actually used it over the portable campfire as shown? I've always wondered about whether it'd be practical to use my CampChef campfire as a cooking heat source, since I hate the idea of lugging multiple large propane-powered circles-with-stands. I imagine you would have hot spots, etc., but something conductive like carbon steel should even things out well enough, I'd think. Just curious about your experience. Thanks! Those are nice bags! I would be interested. 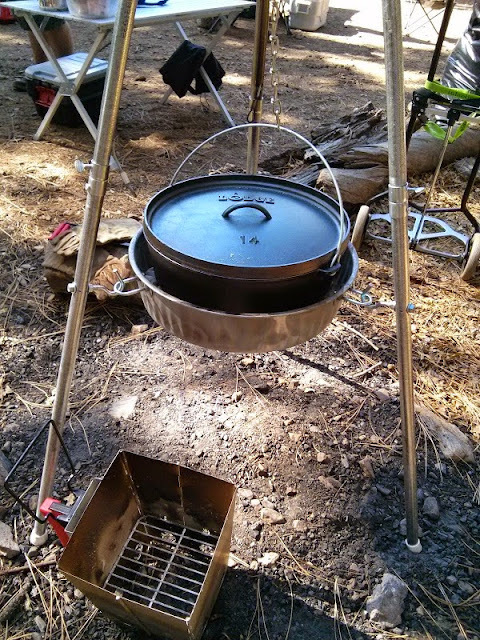 I've cooked in my Dutch oven using a tripod over my Campfire In A Can several times. It cooks evenly and no issues with hotspots. The propane fire ring does leave a ton of soot on the cast iron. I only use it in a pinch due to the extensive cleanup required. If you are doing small batches, like 2 - 6 peoples worth, you might consider making a spacer or modding a charcoal chimney. Nice concentrated heat , and the smaller Discadas fit nicely. This is nice because the chain arrangement lets me raise/lower the oven over the coals. I can also hang a grill that adjusts up/down on cables inside the legs. I'd need to add a spacer to use a discada, though. Hey, that is awesome! Got any for sale? That setup would be so easy to build, could store the tripod in the same bag as the Springbar poles and not take up much space, the wheels are turning in my head! A Galvanized Feed Pan (for livestock). Depending on where you live, may also be available more cheaply as an "oil drain pan" from an auto-parts store. Thanks. I am in SD as well. Thanks for reviving this old thread. I've learned a bit. Looking to get my first two DOs for camp use. Weight isn't an issue as these will go in a trailer, but I'd like to conserve space by nesting. I'm thinking a larger (12"-8qt?) for main meals and something smaller (8"?) for desserts and/or bread. Have to figure out what nests together. This is for a family of 5. What would your recommendation be? What is your opinion of the quality difference between Lodge and the Camp Chef items? Everything I have for home use is Lodge (mostly older), but did see a decent price advantage for the camp chef and saw it referenced earlier in the thread. I have a collection of both and honestly one seems to work as well as the other. I go kayaking in East TN/Western NC and pass by the Lodge factory and have picked up some seconds at their store. I usually carry a 12 inch and either a 8 or ten also when we camp. I almost always use the smaller one to make cornbread. I don't have a 14 inch yet but I plan on getting one at some point. I like roasting whole chickens in a DO and that's really tight in a 12. The biggest issue I have had with the Camp Chef ovens is they usually have some intricate design or lettering on the lids and it's harder to keep clean. The Lodges tend to be less ornate so don't keep charcoal, or in the case of seasoning, big clumps of oil caught in hard to clean corners.